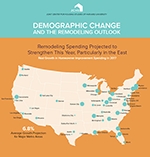 Homeowner spending on remodeling is expected to see healthy growth through 2025, according to Demographic Change and the Remodeling Outlook, the latest biennial report in our Improving America’s Housing series. Demographically based projections suggest that older owners will account for the majority of spending gains over the coming years as they adapt their homes to changing accessibility needs. 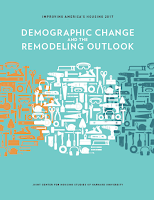 Although slower to move into homeownership than previous generations, millennials are poised to enter the remodeling market in greater force, buying up older, more affordable homes in need of renovations. The residential remodeling market includes spending on improvements and repairs by both homeowners and rental property owners, and reached an all-time high of $340 billion in 2015, surpassing the prior peak in 2007. [See our Interactive Infographic.] Spending by owners on improvements is expected to increase 2.0 percent per year on average through 2025 after adjusting for inflation, just below the pace of growth posted over the past two decades, and about on par with expected growth in the broader economy. Read the full report, try the Interactive Infographic, or join the conversation on Twitter with #HarvardRemodeling.